Second release in a new critically acclaimed Dvorák series. The Staatsphilharmonie Nürnberg is the largest orchestra of the metropolitan region of Nuremberg and the second largest opera and concert orchestra in Bavaria. Marcus Bosch has begun a new series with the complete recordings of the symphonies of Dvorák which has met with enthusiastic response from critics. 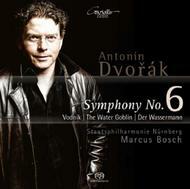 This live recording features Dvorák’s Symphony No.6 and his first symphonic poem, the Water Goblin.